There’s nothing worse than walking into a beautifully decorated living room only to find inadequate lighting. Some of our favorite living room table lamps that combine style and function include different elements that we’d like to share with you. 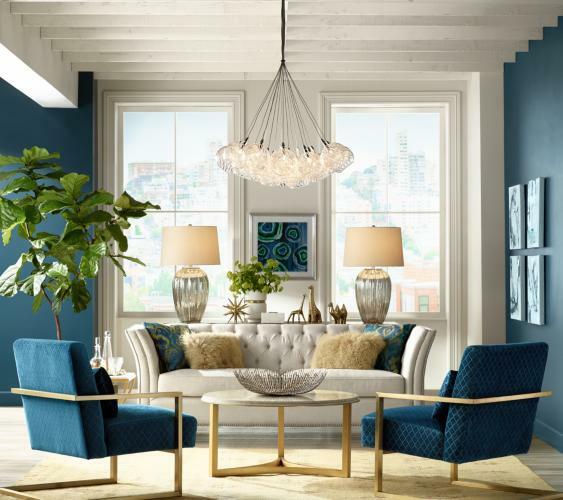 Consider a few decorating tips on how to pick the perfect table lamps for your living room. Choose your color, any color, to brighten up a neutral living room. We’re loving the over 150 color choices in the Color+Plus lighting collection. The detailed shape of a flowering lotus lamp is an easy way to add interest and texture to any space. We love bling and a brass pharmacy lamp adds sparkle while the adjustable arm is perfect for a cozy ready corner. Bring the outdoors in with a branch table lamp with an antique bronze finish. From traditional to rustic to modern, lamps are an easy way to update any living room.